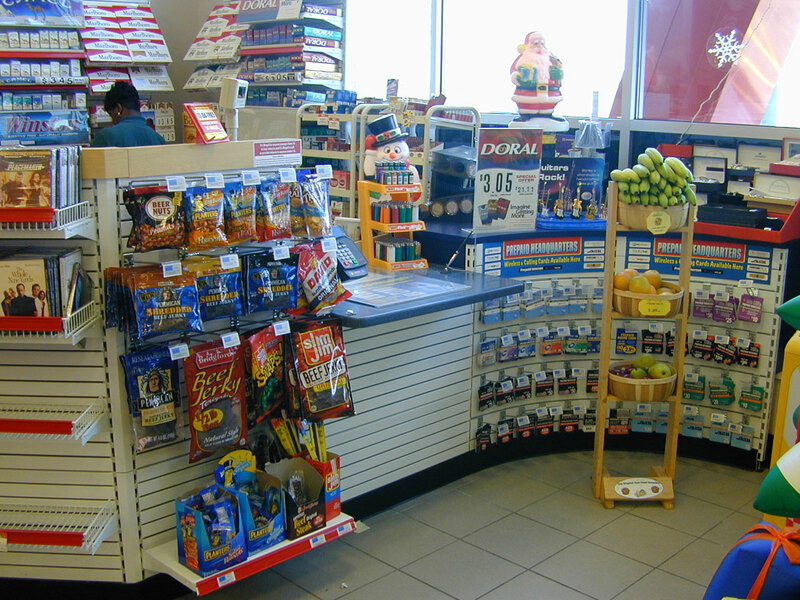 The retail sales counter can potentially have the greatest impact on the customer. 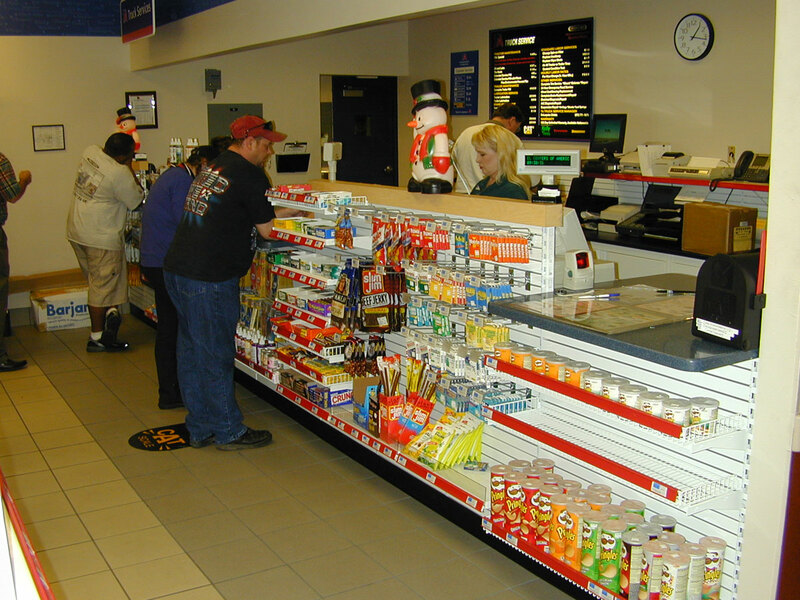 Since every customer must stop here, it is important to make the visit productive and profitable. 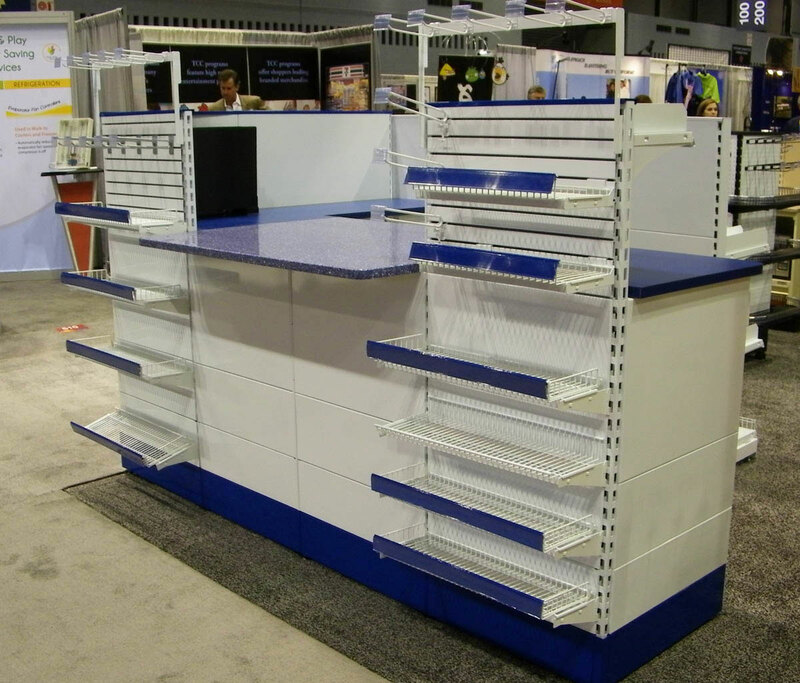 By utilizing the same standard, mass produced components from SHOPCO’s Euro-Style Gondola Shelving, the 4D Upright Sales Counter is a functional, all-metal sales counter designed just for you! 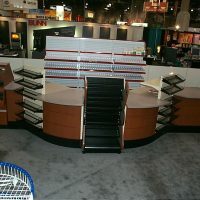 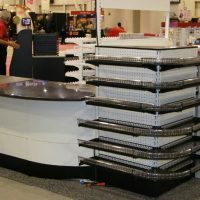 The 4D Sales Counter is a unique component checkout counter design. 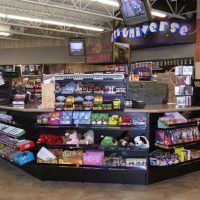 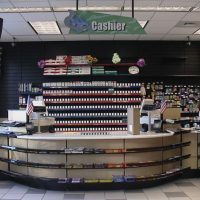 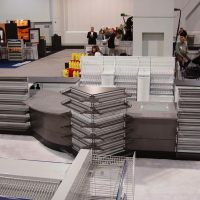 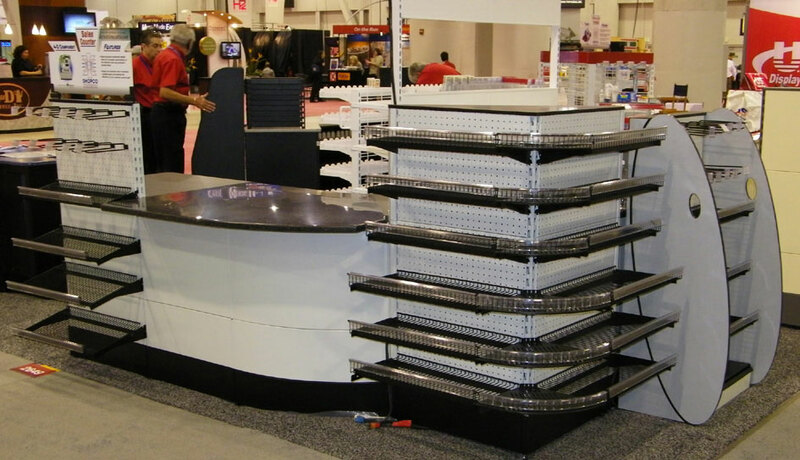 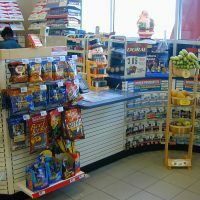 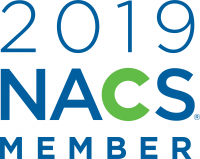 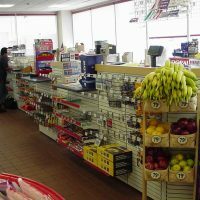 Much like the concept of an “erector set”, this sales counter system is made up of mass-produced standard components that can be assembled in different ways to create a customized solution for all retail merchandising needs. 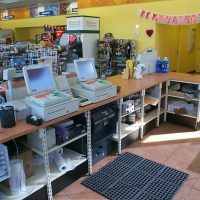 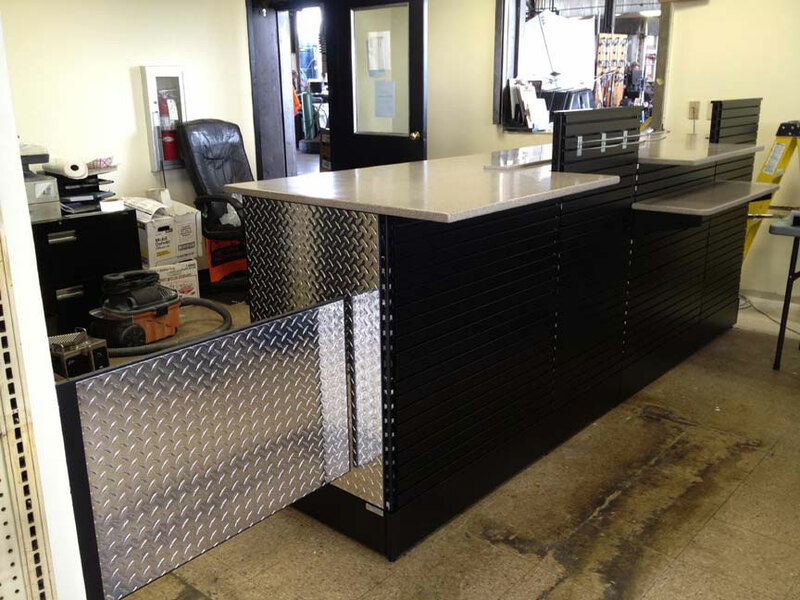 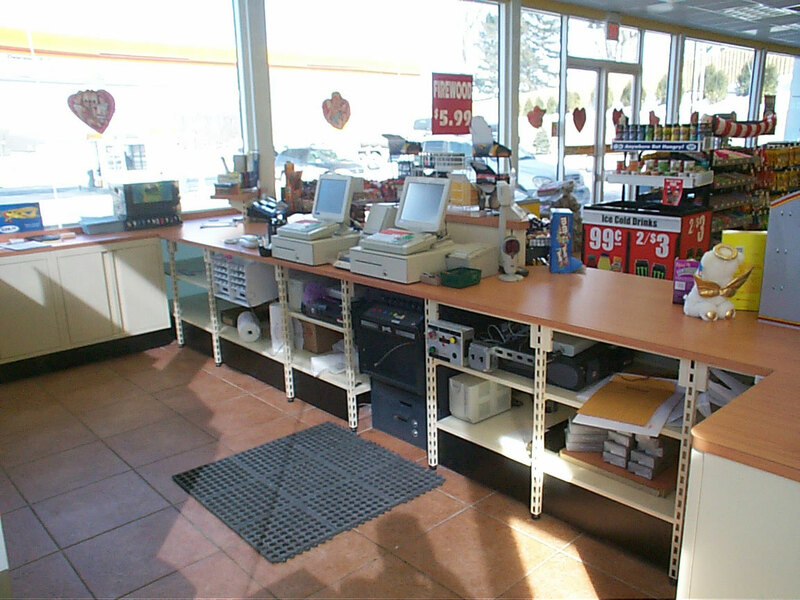 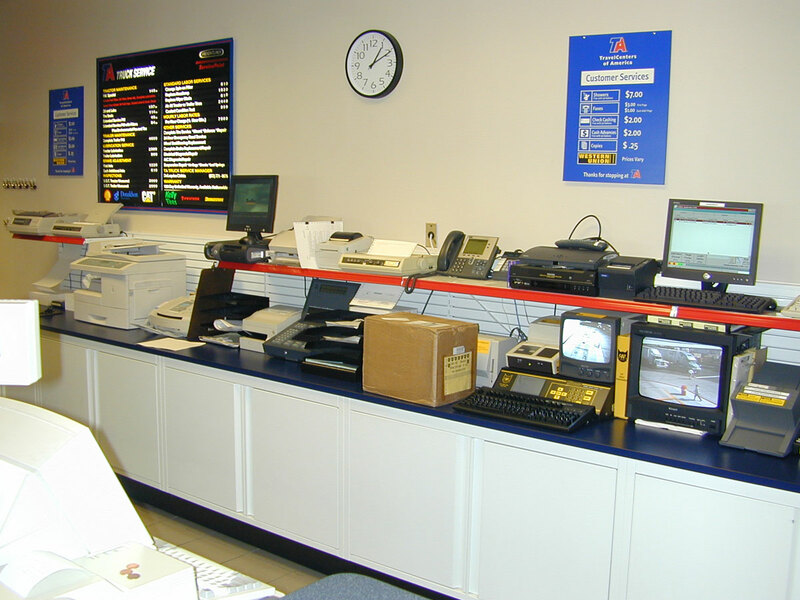 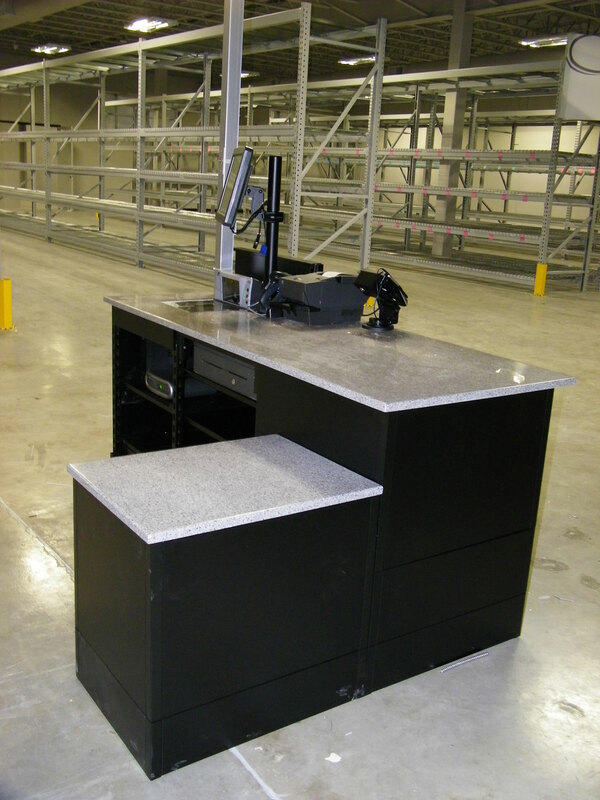 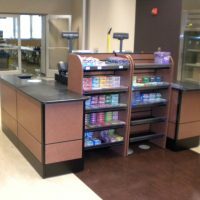 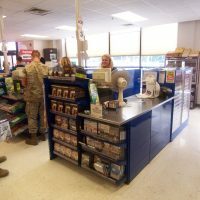 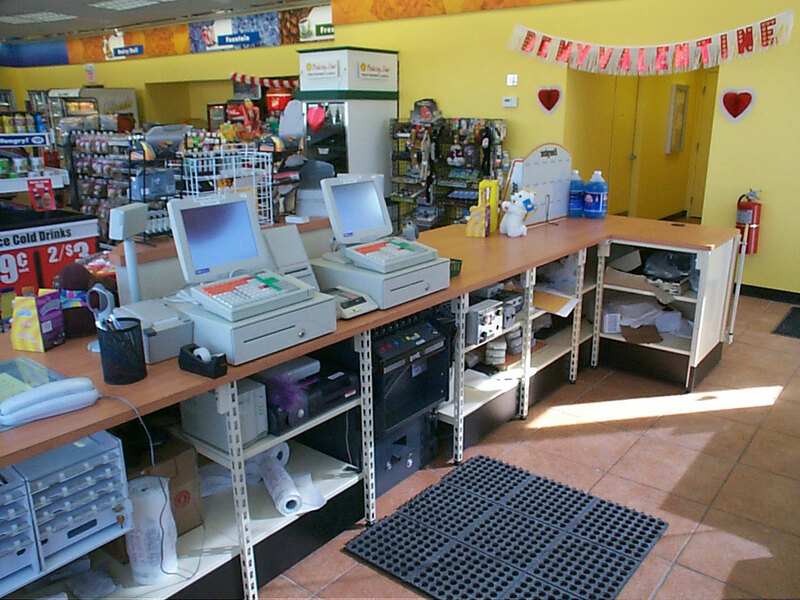 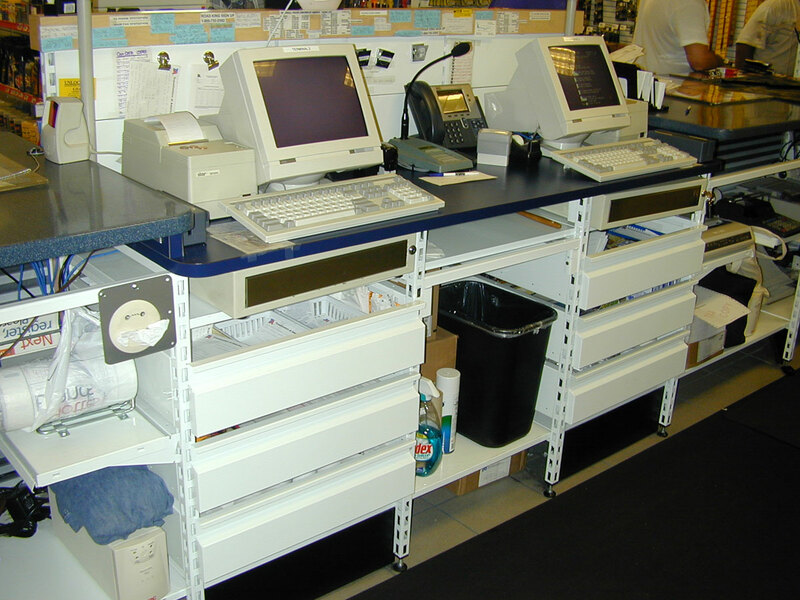 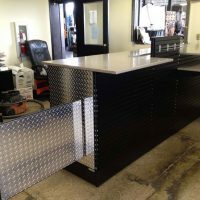 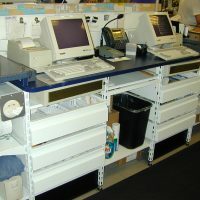 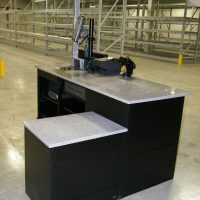 These checkout systems are available with metal smooth, pegboard, slat wall and mini-slat wall panels. 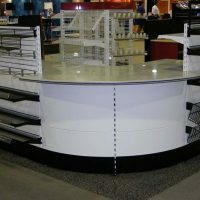 Curved sections are also available. 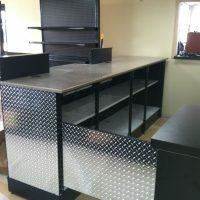 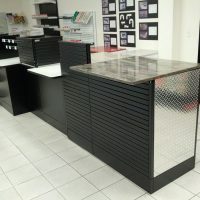 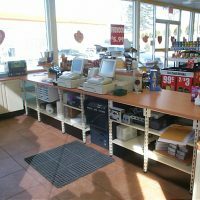 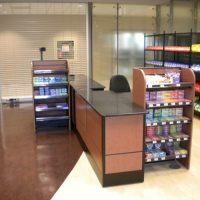 Counter interior on attendant side can be customized to suit various equipment needs as required including interior shelves, cigarette trays, bag holders, printer shelves, trash can areas, drawers and safe openings. 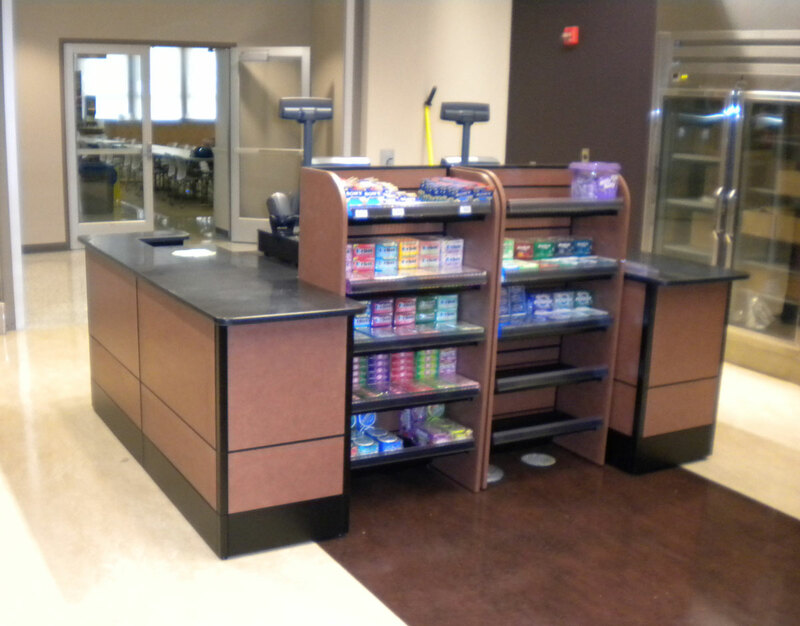 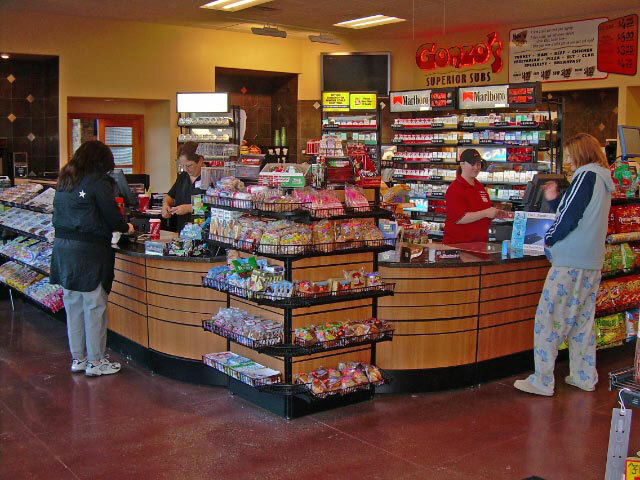 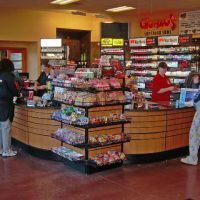 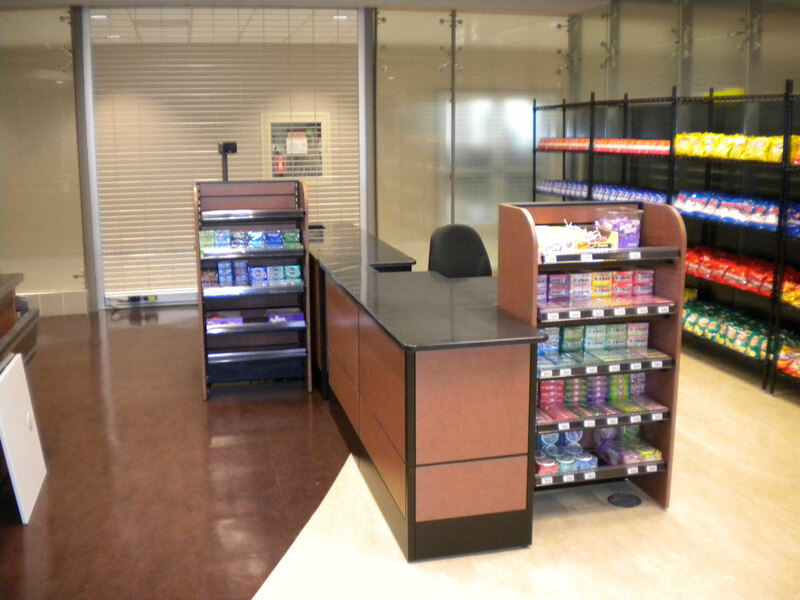 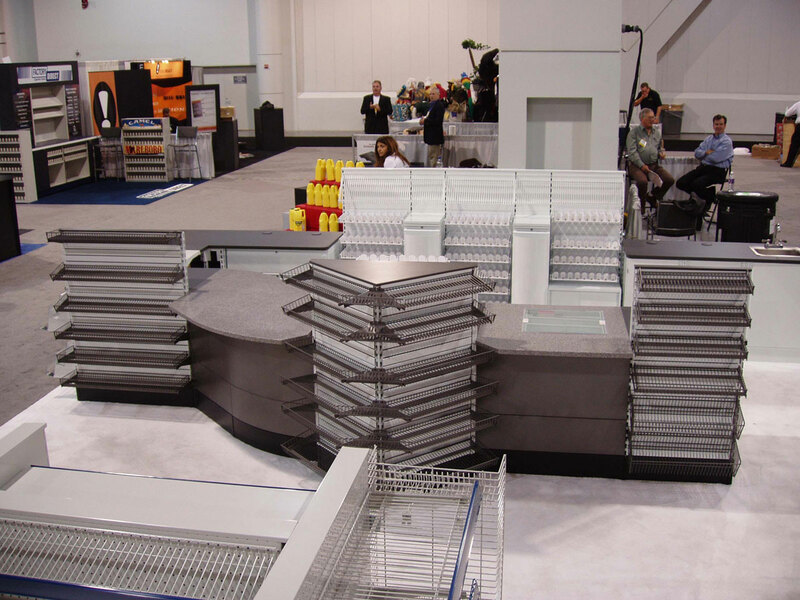 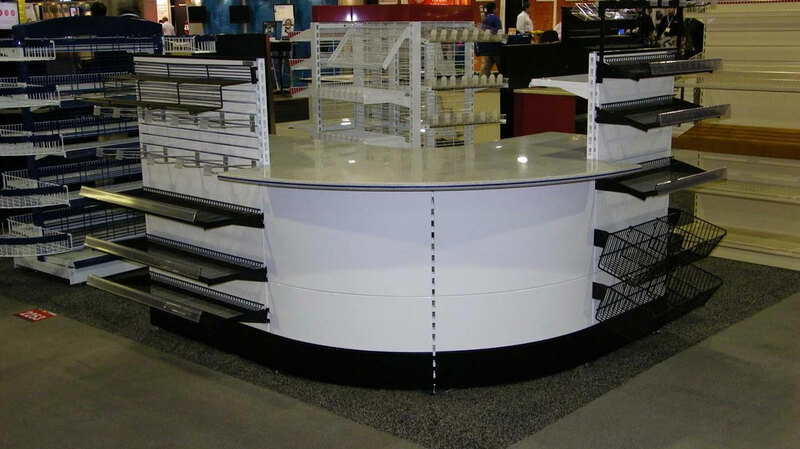 Our Retail Sales Counters can be designed to match our food service counters and gondola shelving systems. 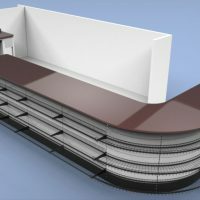 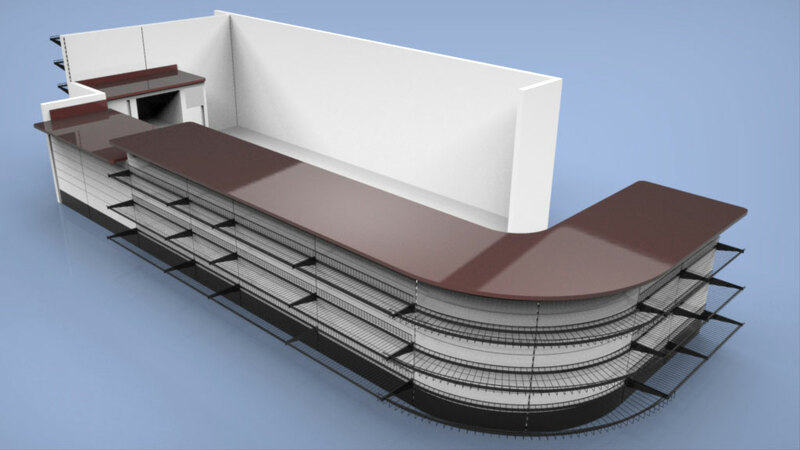 SHOPCO’s 4D Sales Counter incorporates curved and straight sections with vertical merchandising to promote impulse sales, while better defining checkout points. 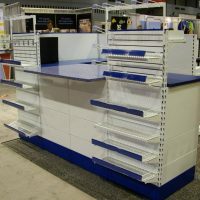 The component sales counter system permits customization of the attendant side for maximum utilization of available space. 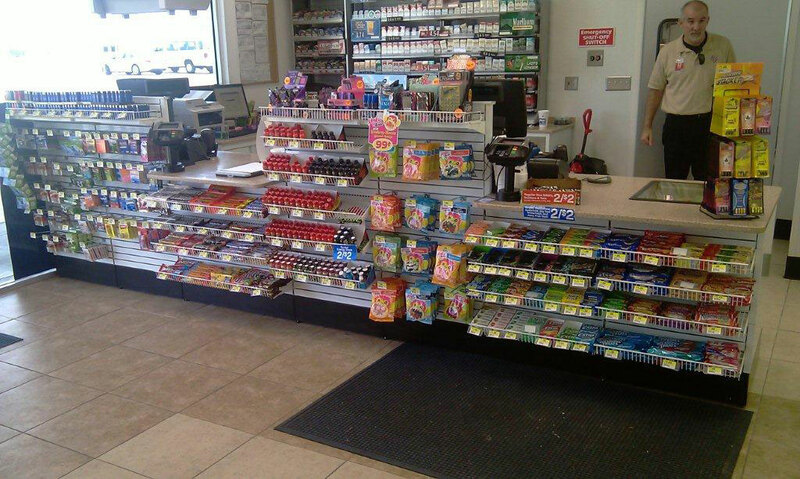 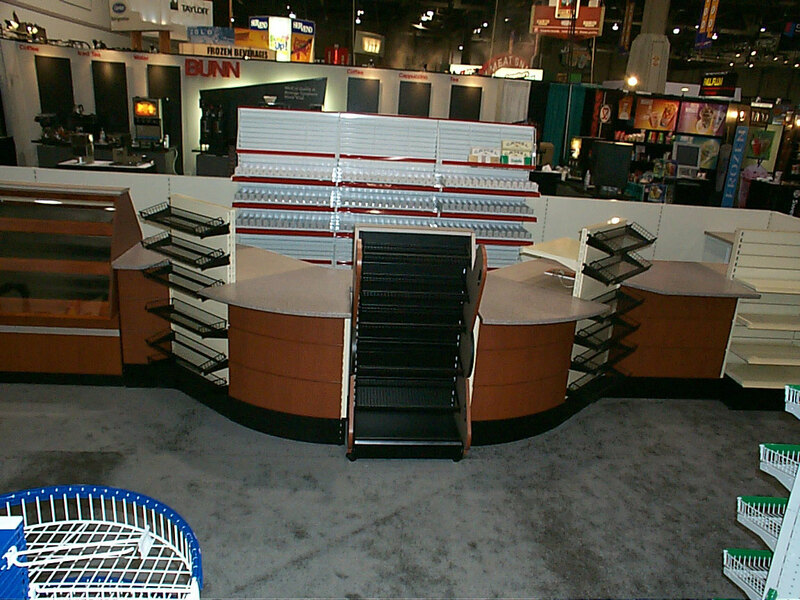 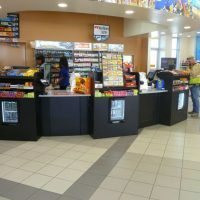 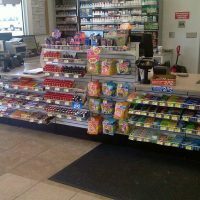 Design your sales counter to fit your specific needs and improve the efficiency of your service attendants. 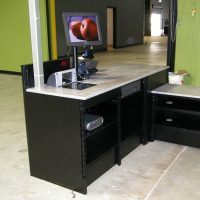 Sales Counters are in stock in black, white, and beige. 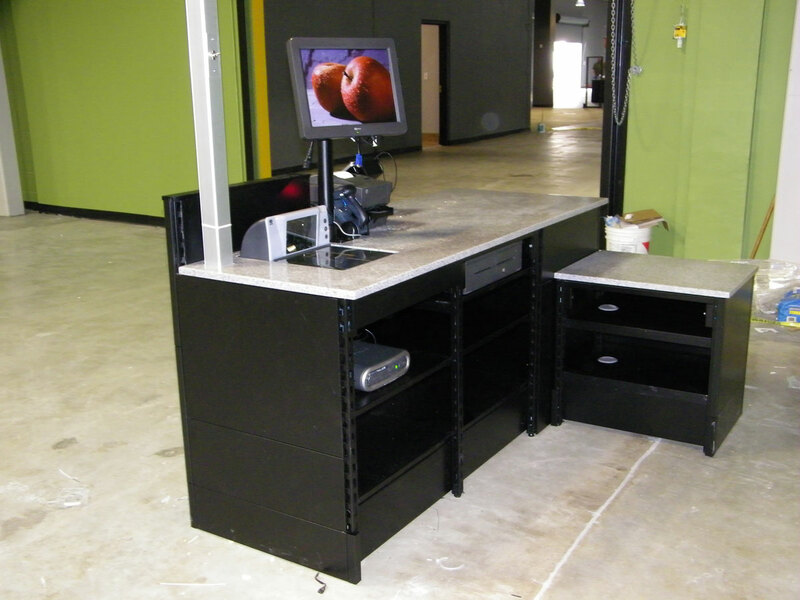 Click Here to view custom colors for the 4D Upright Sales Counter System. 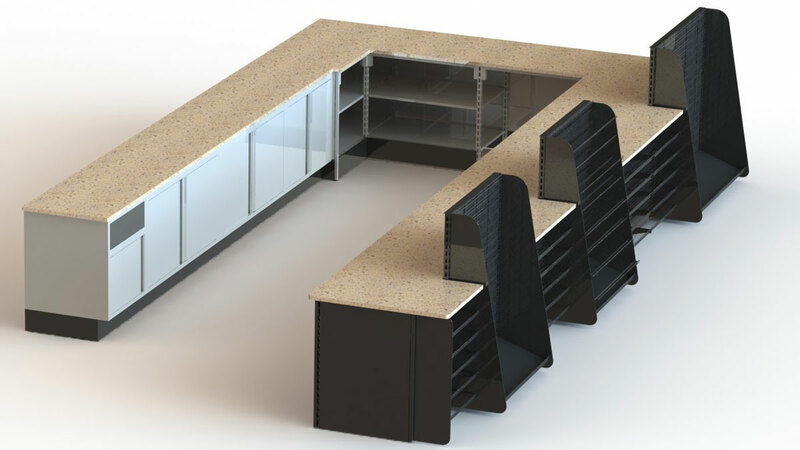 Designed with the intent to impact the customer, the 4D Sales Counter can incorporate true radius corners and shelves, vertical front merchandisers and counter tops in a wide variety of finishes, including laminate, solid surface, or a combination. 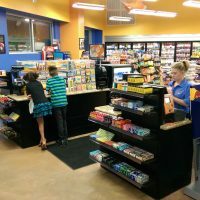 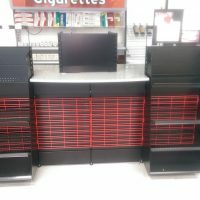 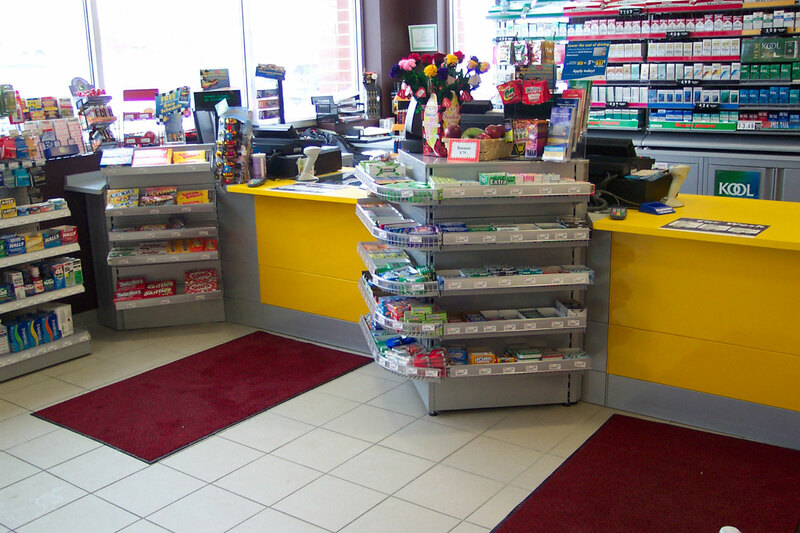 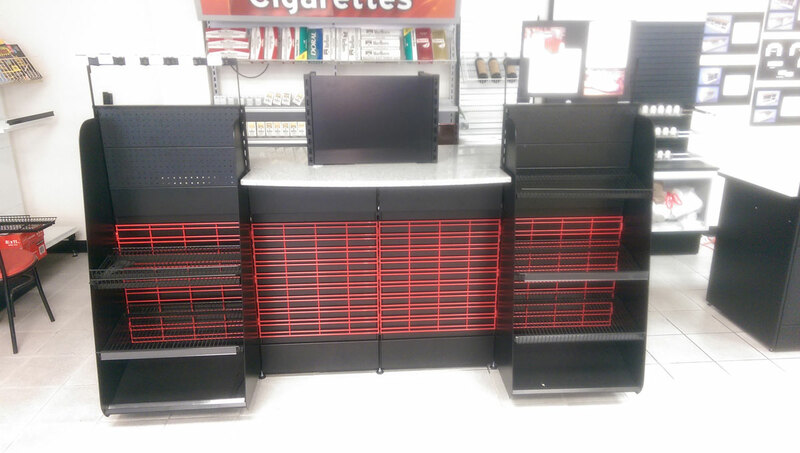 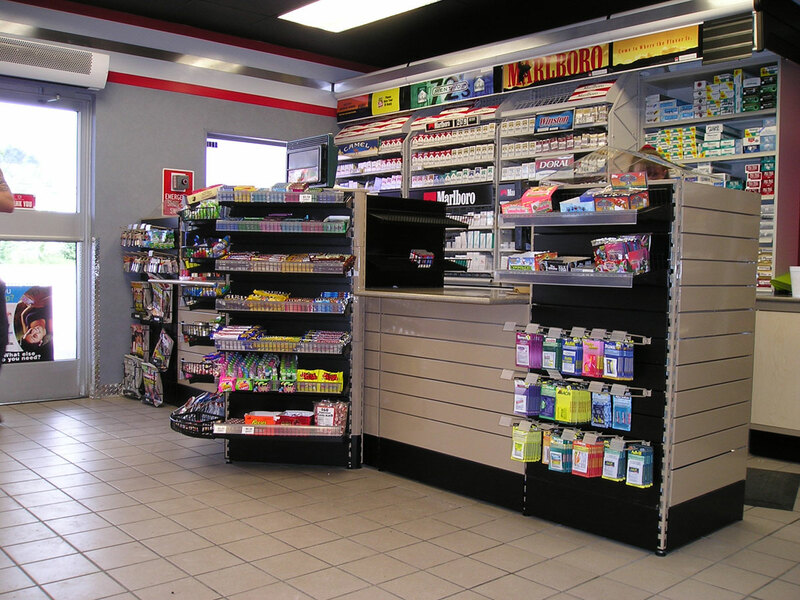 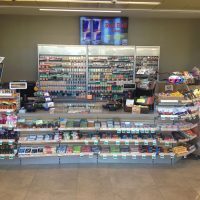 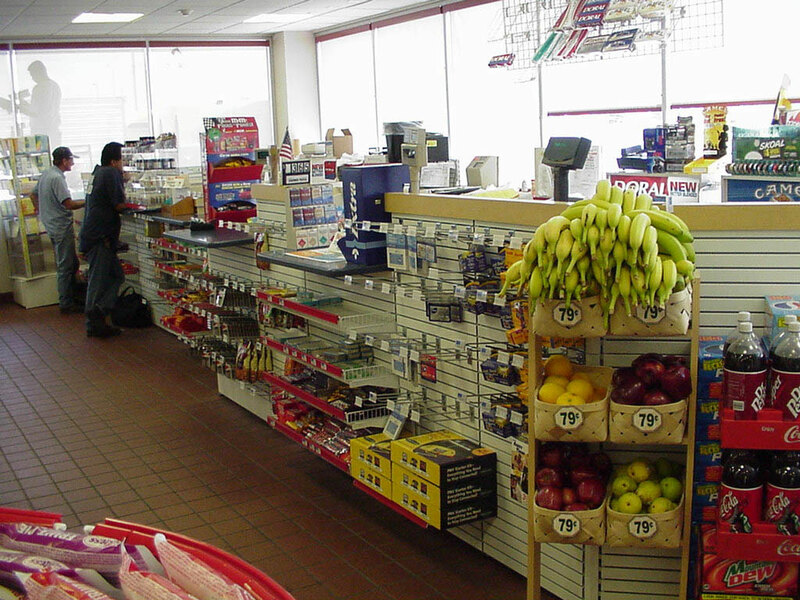 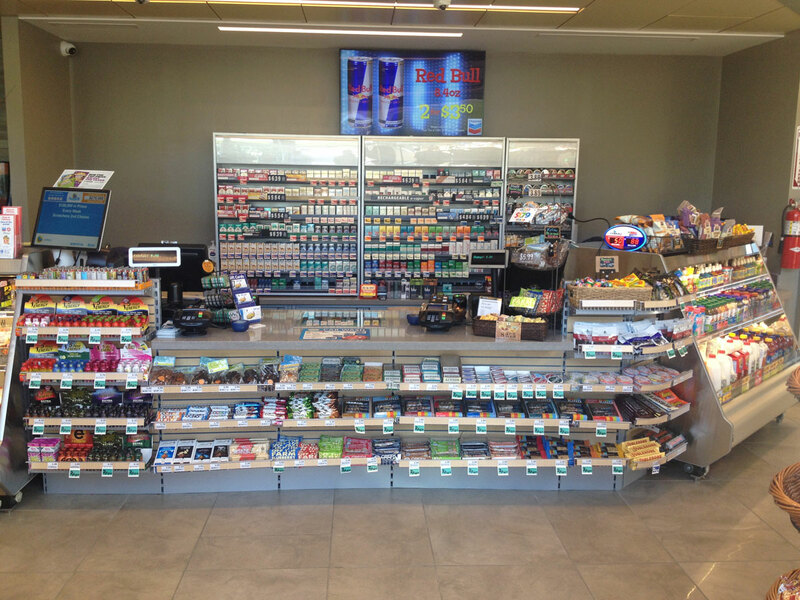 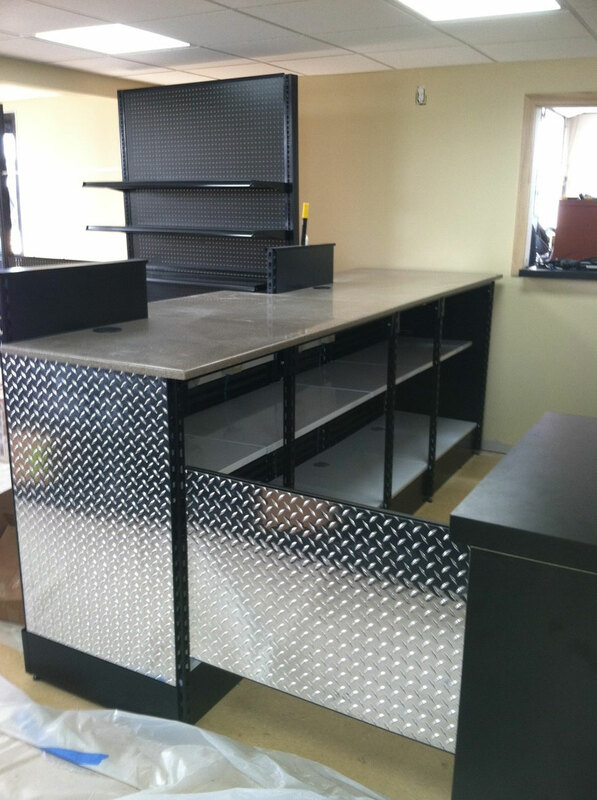 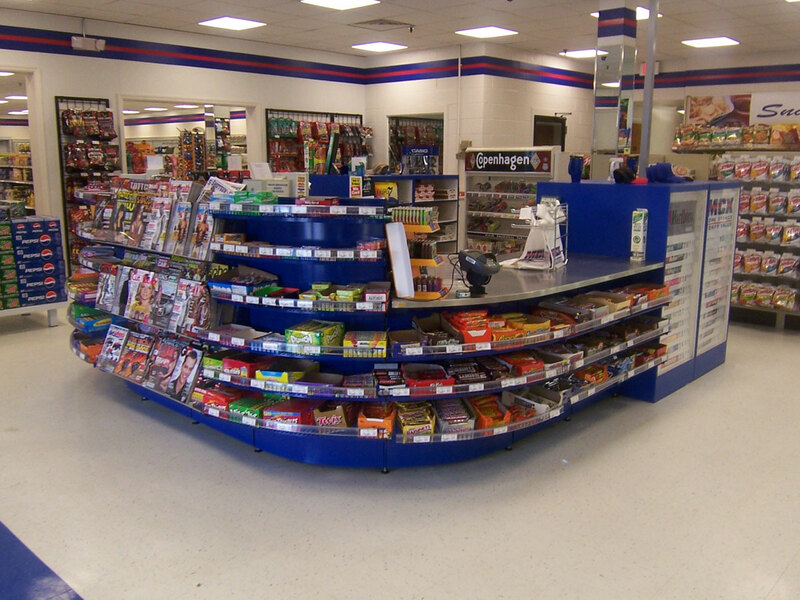 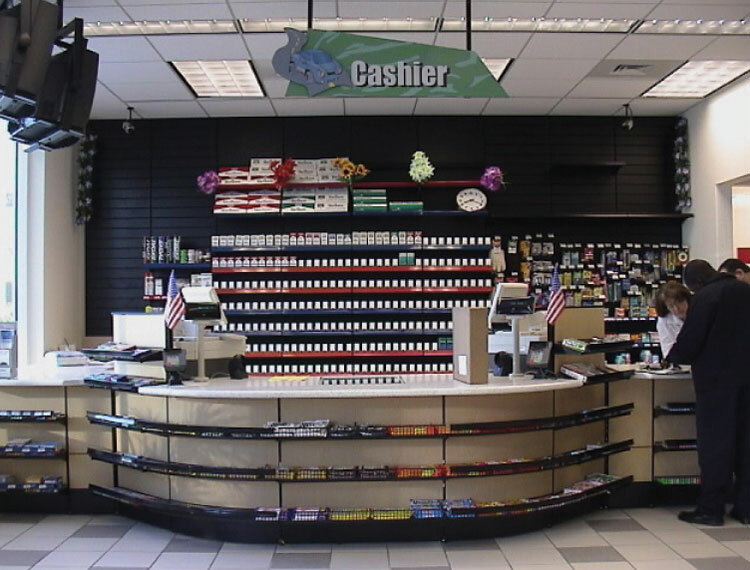 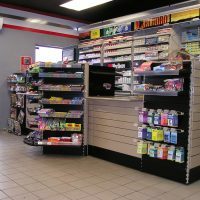 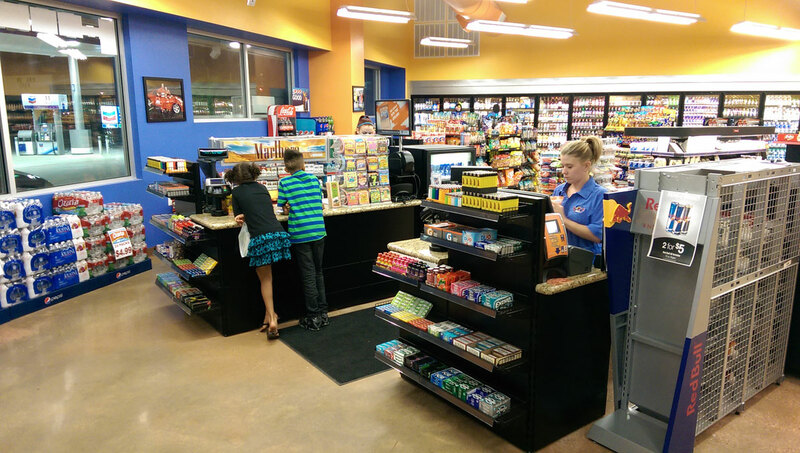 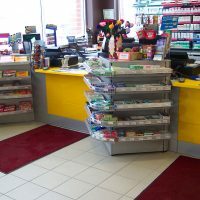 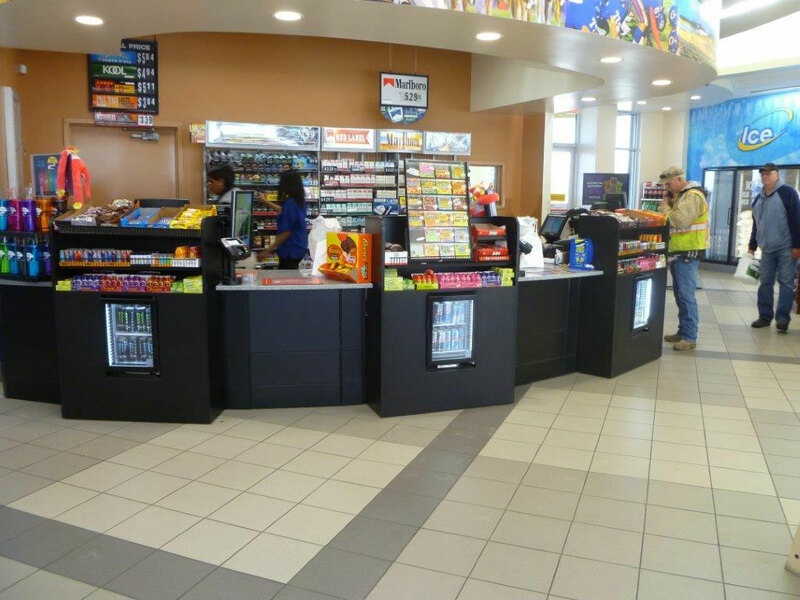 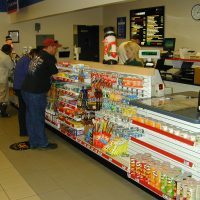 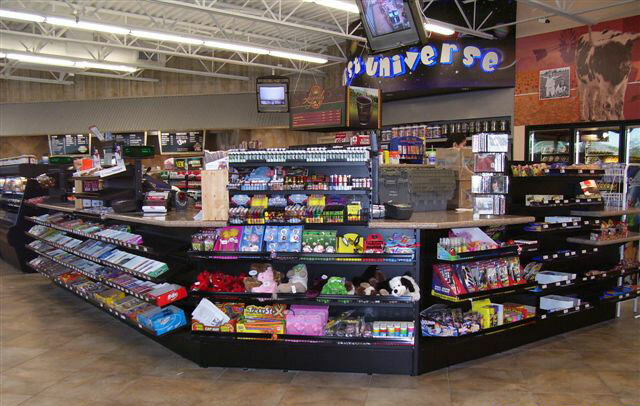 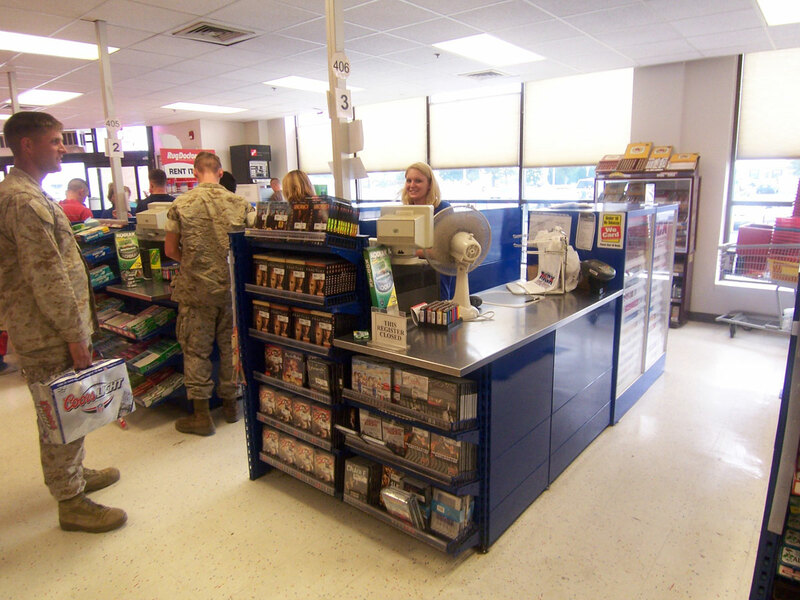 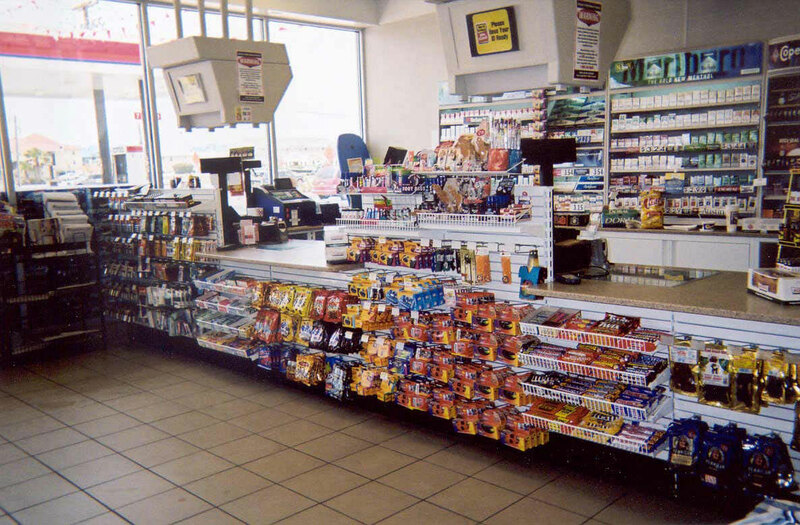 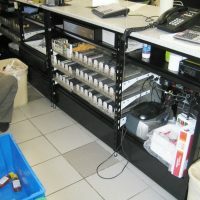 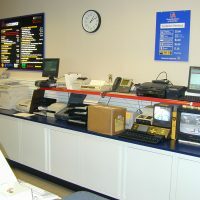 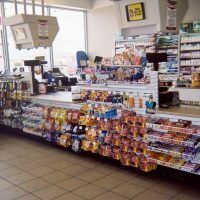 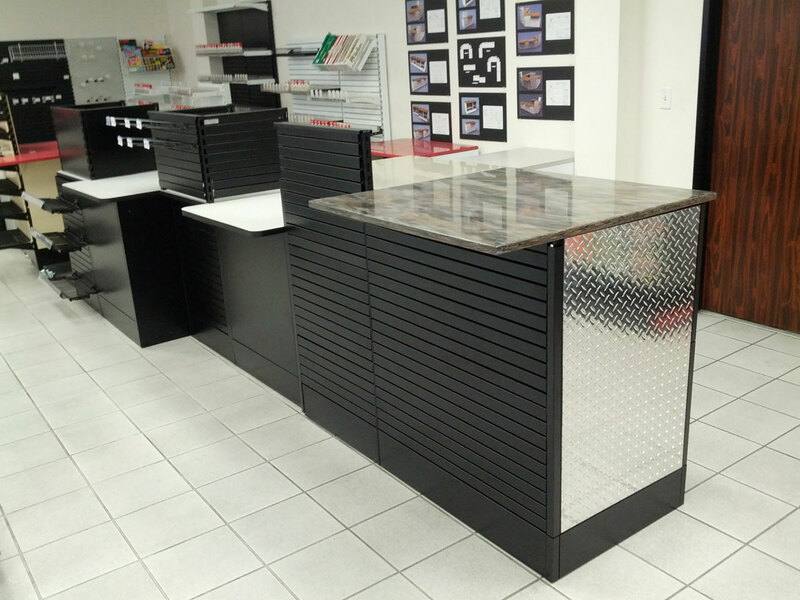 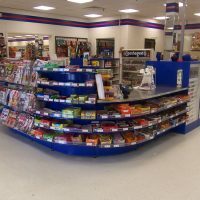 SHOPCO’s sales counters can easily be designed to integrate a wide variety of c-store equipment, cigarette drawers, bagging systems, and more. 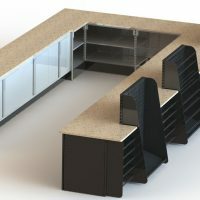 Likewise, SHOPCO’s component style design allows for easy access to all areas of the sales counter for your electrical requirements and offers the ability to embrace many ergonomic features.